While I don't plan on enrolling Noah in an official preschool this year and probably not next year, I do want to start doing some planned learning activities with him at home. Most of what I want to do will involve puzzles, songs, crafts, snacks, and field trips. I have been very inspired by Leah's Mommy School! For the past ten days, I've been focusing on all things "Fall". We had already taken Noah apple picking and he loves saying "apple" all day long. He really loves these apple zucchini muffins, so we made another batch to bring to a MOMS Club Breakfast. I made sure to let Noah help with whatever he was capable of doing. 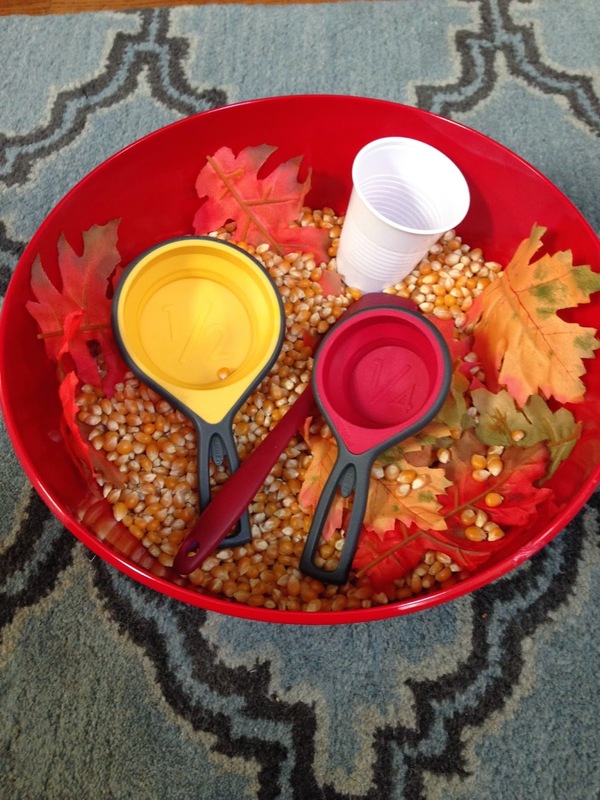 I created this fall themed sensory bin for Noah to play with. I bought a container of popcorn kernels, some fake leaves from the dollar store, and put in some measuring cups and plastic cups for him to fill up. I've found that Noah prefers the simpler sensory bins. Noah loved using the measuring cups and spoons to fill the cups with the popcorn kernels. The first time playing with it he was pretty careful not to make a mess. However, the next morning when he was playing with it he started throwing the kernels. It's easy to clean up, but just to warn you it will probably make a mess. One evening, Chris helped Noah make a fall inspired craft with a sponge brush and some paint. He loved it and it turned out great! While hanging out at home, I would sing the following songs to Noah. Sung to: "Farmer in the Dell"
Pretty leaves are falling down, falling down, falling down. Pretty leaves are falling down, all around the town. Let's rake them up in a pile, in a pile, in a pile. Let's rake them up in a pile, all around the town. have some fun, have some fun. Let's all jump in and have some fun, all around the town. Sung to: "Ten Little Indians"
Blow them all away. Whoosh! Sung to "Five Little Monkeys Jumping on the Bed"
The juiciest apples you ever did see. I was hoping that the leaves would have already started to change when we went to Vermont, but no such luck. The drive up 87 would have been even more beautiful with the colorful leaves. Once the leaves do change, I want to take Noah on a nature walk. I plan to do a bunch of pumpkin/Halloween activities with him in October, so I can just incorporate anything we missed then. Fantastic ideas. Love the sensory bin idea! Love the sensory bin idea! You are one brave mama with all those popcorn kernels. That's lucky that Noah was so cautious at first because I think Mason would just chuck them everywhere! ooh it is perfect!! I love the sponge tree. Aria and I did paint in bags taped to the windows on the back door...you know or whatever name that is called =) I was calling it finger paint bags. I thought that would be fun with fall colours too. I just did it on a whim. It was fun and not messy! The sensory bin is such a fabulous idea! And the painting looks like it could earn a coveted spot on the refrigerator, and LOVE the "fall" themed songs! Thanks for linking up with us!! I'm loving your sensory bin idea. I'm going to steal that for my little guy. And I love the songs. I'll be singing them all Fall long. It's The Little Things | Going to the Zoo! Fall Mantel | Happy 1st Day of Fall! 25 Things to do this Fall!